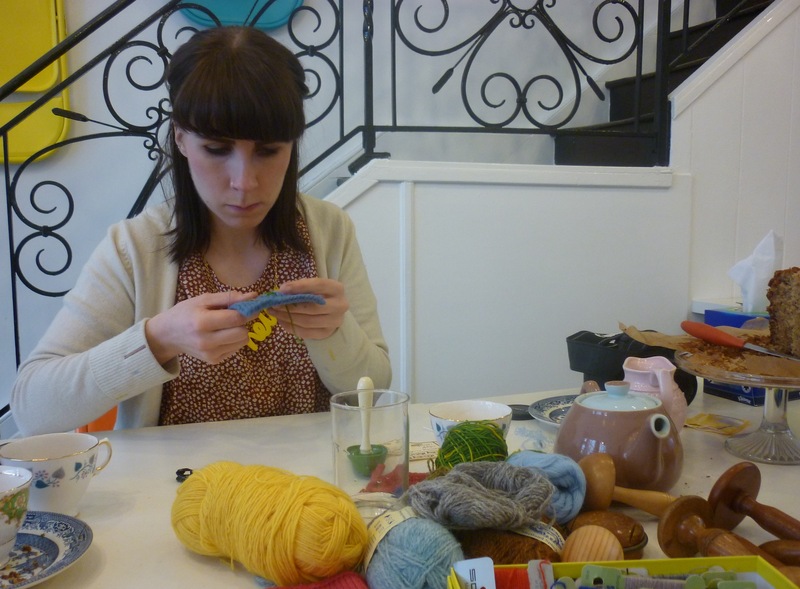 When I taught my first darning class at Super+Super HQ, I noticed Amy’s cardigan, as it has some delicately embroidered details on shoulders and cuffs. Amy has had the cardigan for about 18 months now, and at first, she wore it everywhere she went – she was that excited about this beautiful merino fine knit garment. But as often happens when the candle burns too brightly, the novelty soon wore off and the cardigan suffered from Familiarity Fatigue and ended up in the back of the wardrobe. She was in dire need of a Fashion Intervention, but it took a while before inspiration struck. 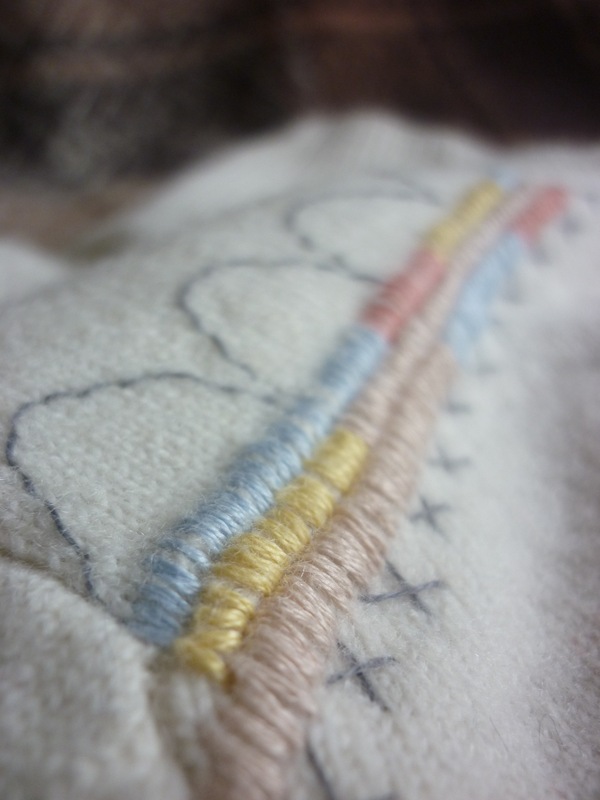 However, when she found out about Karen Barbé’s embroidery style, it was not long before the Eureka! moment happened. Mainly whilst sat in bed watching Mad Men Series 4, nimble-fingered Amy embroidered and embroidered and embroidered. She claims the colours used ‘were just lying around’ – she’s done a great job putting them together using running stitch, cross stitch and straight satin stitch. They remind me of Italian ice cream, the ones that are put into a cone with a spatula as it’s too soft to scoop. The sleeves were a little bit too long, and Amy always wears the cardigan with the cuffs turned up. She decided to turn that into a permanent feature and embroidered them in place; a job she found particularly satisfying. As you can imagine, after putting in all that work, this cardigan has turned into a firm favourite once more, and it’s shows how with a little bit of embroidery in the right places you can put your own mark on what used to be a perfectly nice, if somewhat unremarkable cardigan. Amy has done such a pretty job, I often embroider plain tee shirts as well…it not be elaborate, just tasteful and personal. this is hott, thank you. 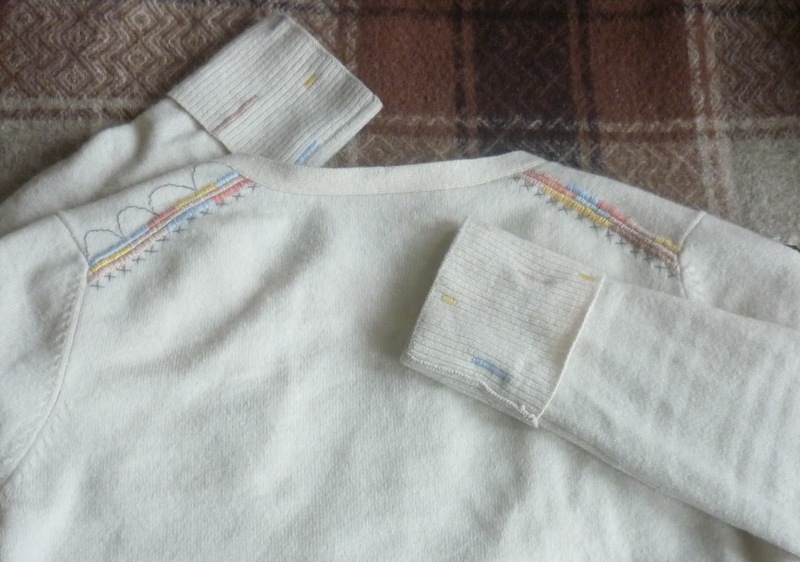 could you recommend darning wool, available online, to mend cashmere sweaters? 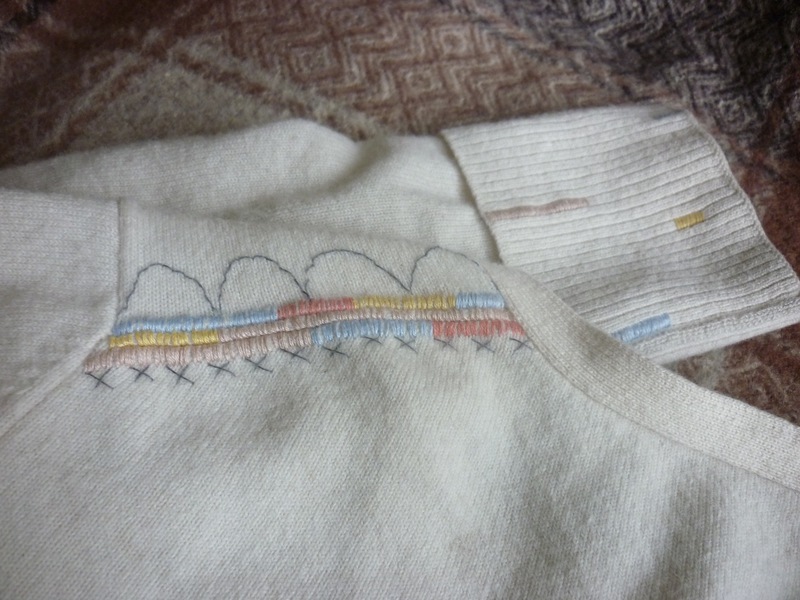 sock darning wool seems to have nylon in it and perhaps to be too sturdy for upper body wear? I would still go with sock mending darning wool, or perhaps a product called woolly nylon. I don’t think it matters much if it has some man-made fibre in it. If it’s a small hole and you want it to blend in, it’s more important to get the same size thread and colour, than what exactly it is made from. Mending with something that is more sturdy than the thing mended is okay. 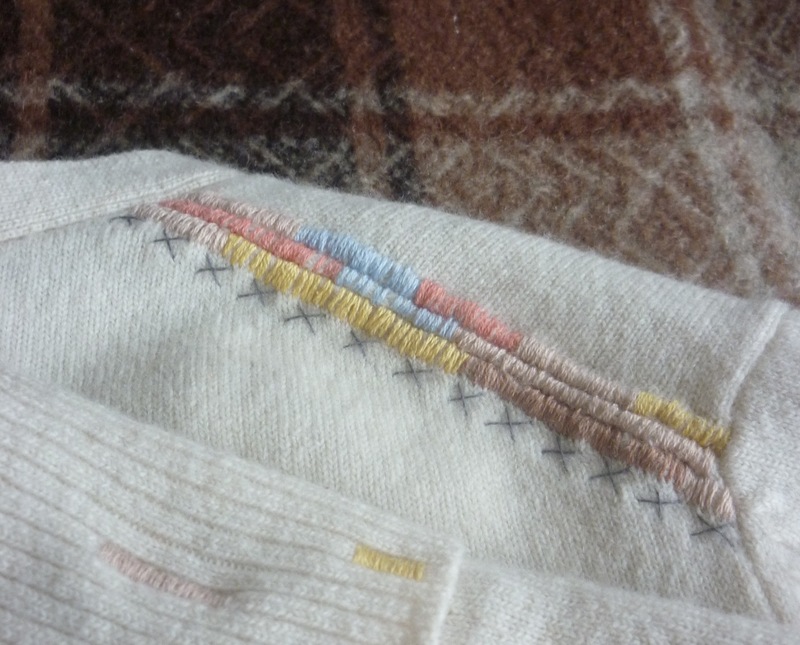 It’s more of a problem if you wanted to mend something with a weaker yarn (so e.g. 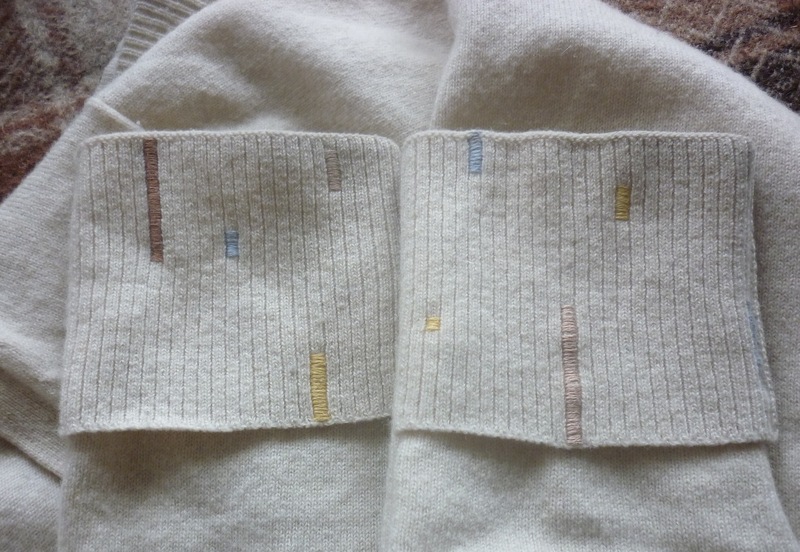 I wouldn’t mend a walking sock with cashmere, as it would soon develop a second hole). thank you, there really seems only to be sock darning wool.